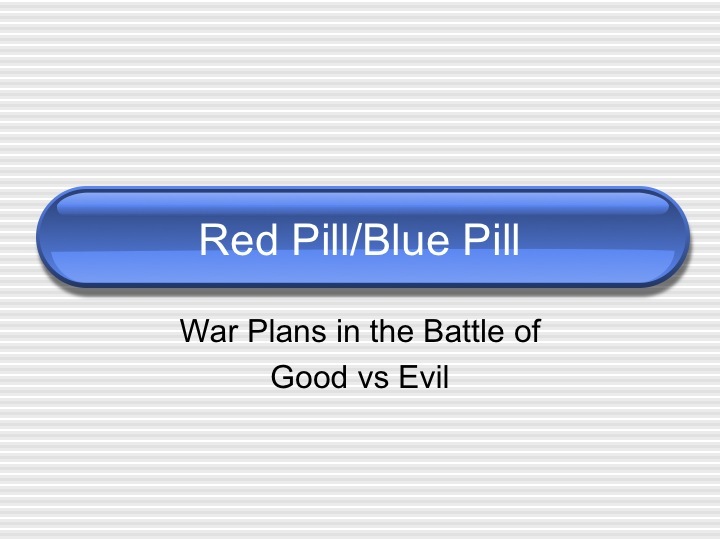 Encase you were not familiar… the clip above is from Matrix…The term red pill and its opposite, blue pill, are now…pop culture terms that have become a common symbol for the choice between the blissful ignorance of illusion (blue) and embracing the sometimes painful truth of reality (red). I think when we are/were saved was all chose the RED pill…Jesus offered us the TRUTH…and something MUCH more…now we should see things differently we are not in the dream world that perhaps our neighbors live in, in fact we see things… should see things so differently that we know there is a real GOOD and there is a real EVIL out there. These concepts of good and evil are odd in that they are really not very popular are they? 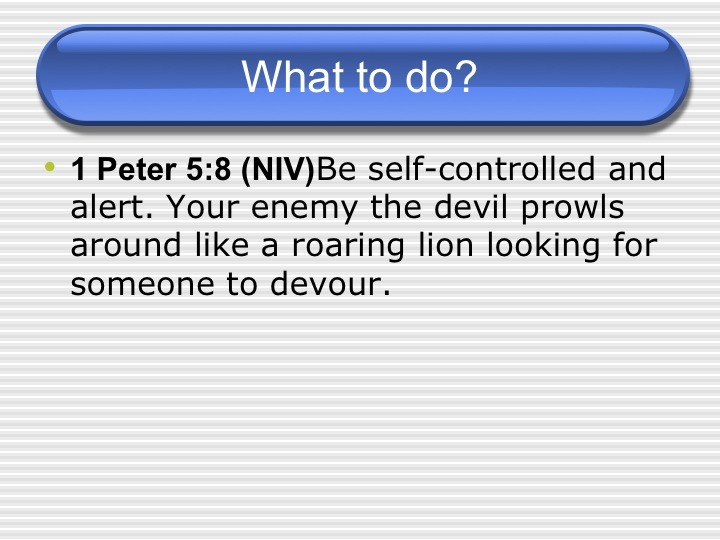 Over time when you purposely try to live the way of Jesus (GOOD), you start to notice something deeper going on. You begin to realize the reason this is the best way to live…. It is rooted in the profound truths about how the world is. You find yourself living more and more in tune with ultimate reality. You are more and more in sync with how the universe is at its deepest levels. And God is the ultimate reality….There is nothing more beyond God. 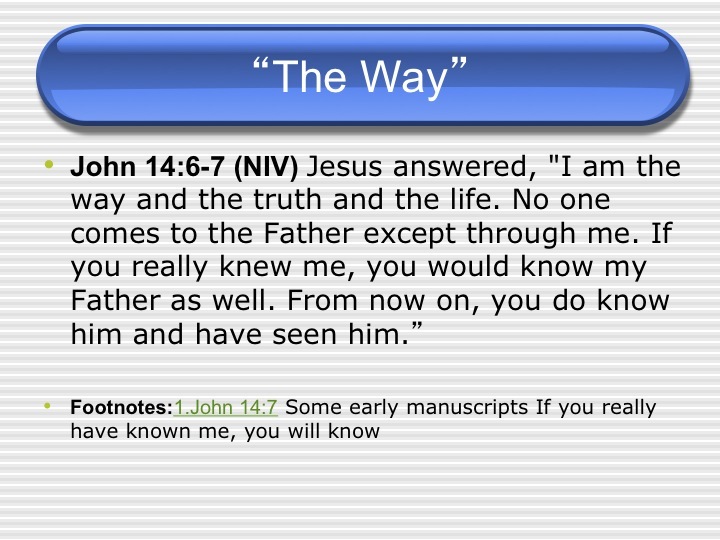 So… the way of Jesus is not about religion… it is about reality… so what does this have to do with evil? Well… there are two realms….If we choose to follow the WAY of Jesus, the GOOD…and we can choose to pursue that… then there is also another way. A way that is out of sync with how God created us to live. The word for this is HELL… That’s a pretty loaded word… but its a place, a way, a realm absent from how God desires things to be… I do have to note…that God is indeed in there…in the chaos….but…we can bring Heaven to earth… and we can bring Hell to earth. The word Hell is found 14 times in the Bible, 12 of those are found in the teachings of Jesus… The word HELL in English is the word gehenna in Greek. Gehenna is a reference to the valley of Hinnim, a ravine on the south side of Jerusalem. This valley was the site over the years of many violent and horrible deaths, and it came to be viewed as cursed. By Jesus’ day it had become the town dump. Garbage, trash, wild animals fighting over scraps of food, fires burning—a place of waste and destruction. Some referred to it as the place with the gnashing of teeth where the fire never dies. 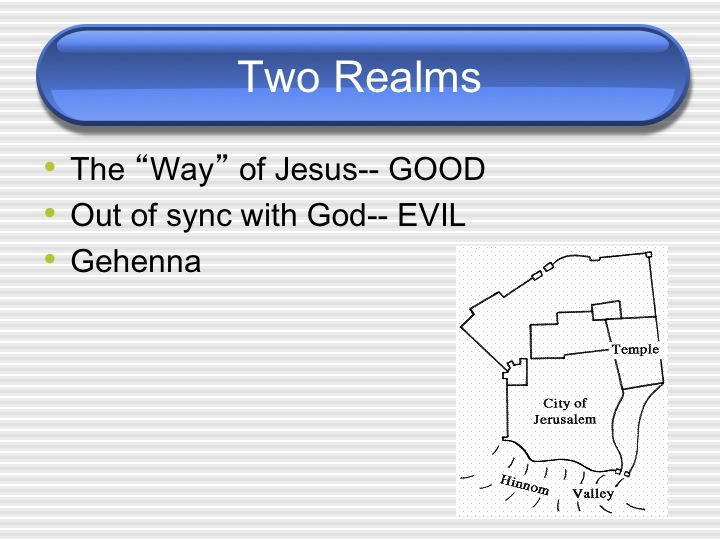 So when Jesus uses Gehenna, it is loaded with meaning and visual power—everybody knew what he was talking about. For Jesus Heaven and Hell were present realities. Ways of living we can enter into here and now. He talked very little of the life beyond this one because he understood that life beyond this one is a continuation of the kinds of choices we make here and now. 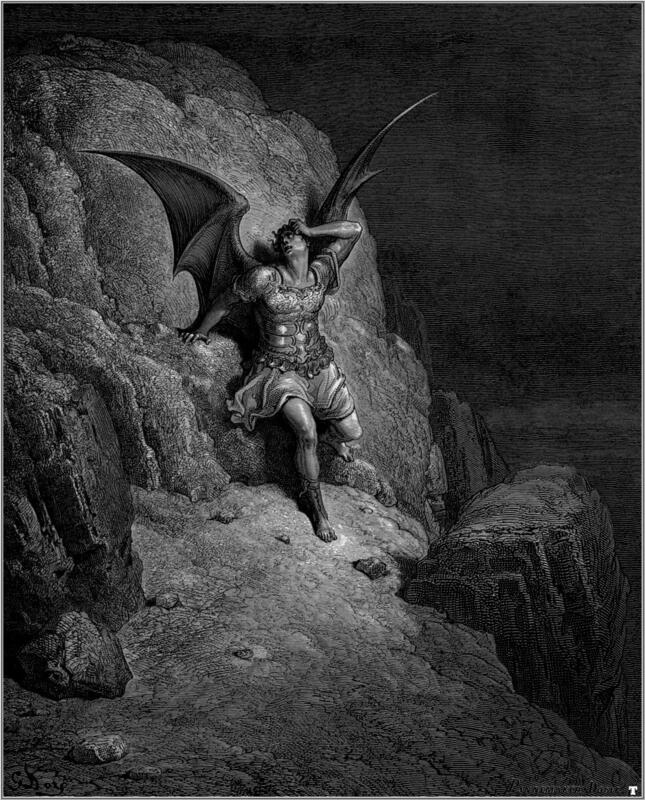 When folks use the word hell…what do they mean? They mean a place, an event, a situation absent of how God desires things to be…Famine, debt, oppression, loneliness, despair, death, slaughter—they are all hell on earth…. So what does evil look like? Article subtitle: Air Force Chief Master Sergeant John Gebhardt, of the 332nd Expeditionary Medical Group at Balad, Iraq, cradles a young girl as they both sleep in the hospital. The girl’s entire family was executed by insurgents; the killers shot her in the head as well. The girl received treatment at the US military hospital in Balad, but cries and moans often. According to nurses at the facility, Gebhardt is the only one who can calm down the girl, so he has spent the last several nights holding her while they both sleep in a chair. This is… I am not sure… but lets call this beautiful baby Rebecca… and Becky was playing outside of her house one day when a group of “insurgents” came up and executed her entire family…Mom and Dad, brothers and sister, executed….right in front of her… Her dad (perhaps) did not like what the insurgents stood for, perhaps he was interested in joining the Iraqi police department to protect his neighbors, friends and family…Becky was shot by the insurgents… right in the head… if you look at this baby, you can see the stitches in her scalp…she was left for dead, until some US troops happened by and found her and rushed her to the hospital. She received treatment from US service men and women at Balad….but she cries and moans often….and according to the nurses there Chief, yes, crusty old Chief Master Sergeant Gebhardt is the only one who can calm her down… he would sleep every night in a chair with Rebecca just to get her to sleep, holding her while they both tried to sleep. 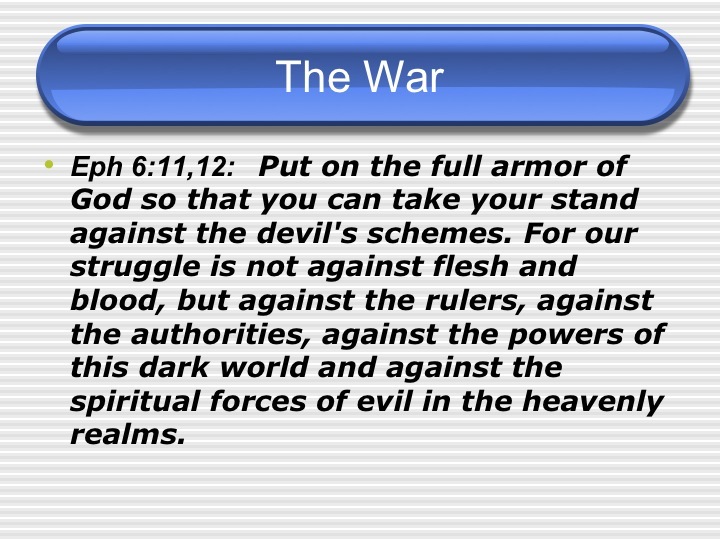 The Bible tells us to get suited up for battle… and our battle is against the devil, evil, Satan, I don’t care what phase you want to use…evil. Are you ready for this battle, this war? WE are in it right now… you chose the RED Pill…right? 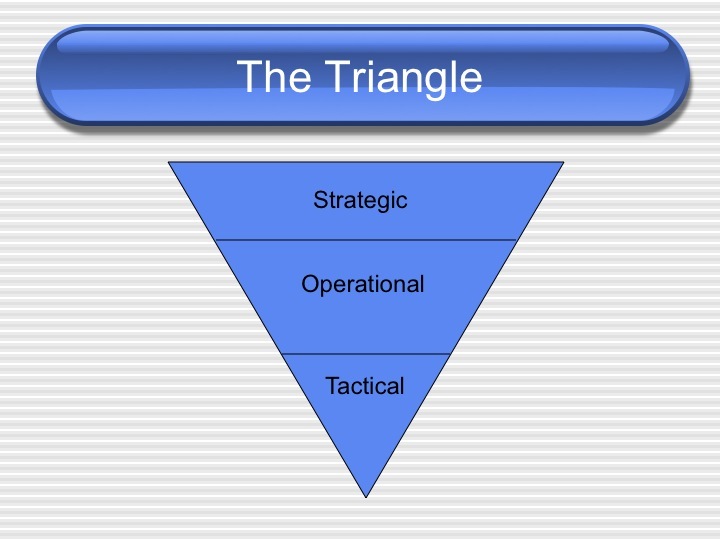 I would tell you the key to strategic planning… is first to look at the enemy Centers or Gravity, that is what you want to attack to disable the enemy in the quickest way possible….while at the same time identifying the friendly (your) center of gravity and protecting it. 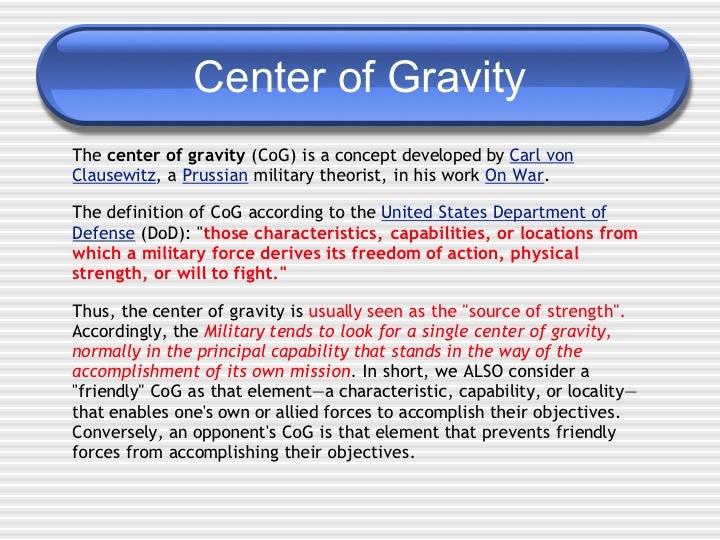 The center of gravity (CoG) is a concept developed by Carl von Clausewitz, a Prussian military theorist, in his work On War. Thus, the center of gravity is usually seen as the “source of strength”. We consider a “friendly” CoG as that element, a characteristic, capability, or locality—that enables one’s own forces to accomplish their objectives. Conversely, an opponent’s CoG is that element that prevents friendly forces from accomplishing their objectives. 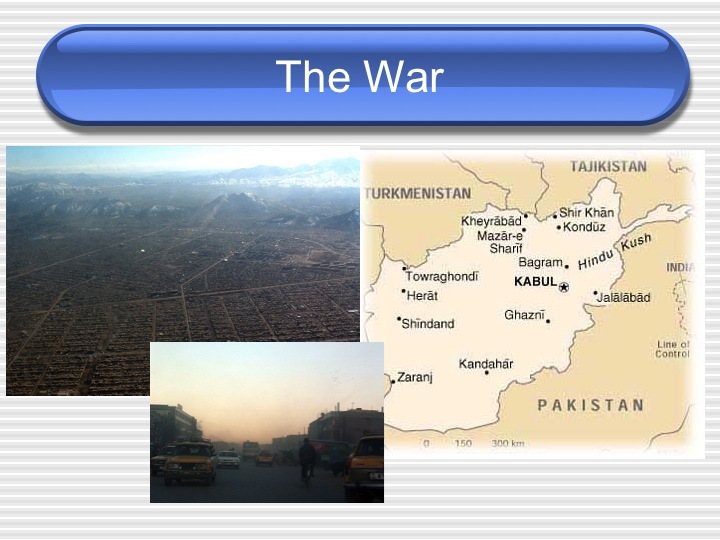 I think the COG in this spiritual realm, is much like the COG we are working in Syria, Libya, or Afghanistan…funny… we are talking evil in a Biblical sense while at the same time this is the truest center of gravity in an on-going war. We also need to examine at length the enemies’ most likely plan and the most dangerous plan and prepare for both. What CoG was Jesus looking for…hearts and minds? 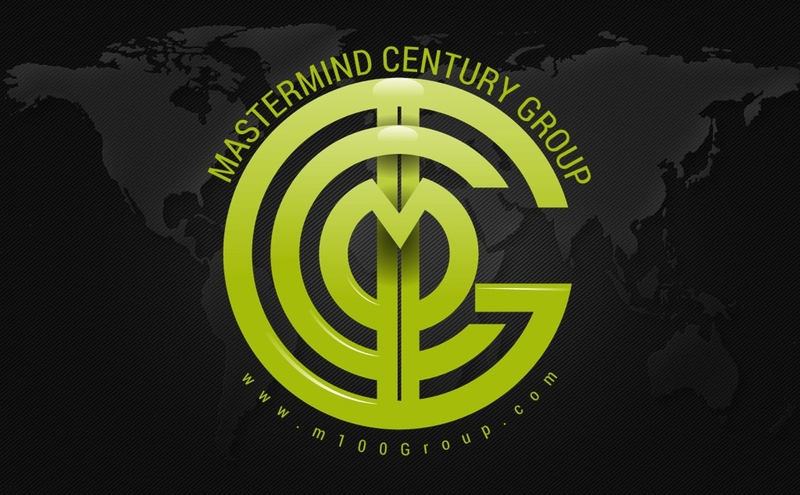 Think about this…He discipled 12 men that changed the world… TOTAL focus on 12 men…on their hearts and minds…. What are we going to do about it? I might ruffle some feathers here… but there are stats that Promise Keepers puts out on people “coming to Christ” and I could not find them, but I heard them when I was at a PK event in Atlanta… if a woman comes to Christ there is like a 20% chance that her family will follow, if a male teen comes to Christ…there is something like a 30% chance the family will follow…when a man comes to Christ…. 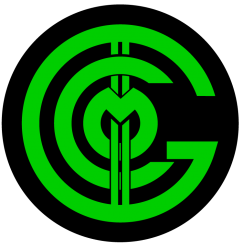 There is like a 90% chance his family will follow… so if our CoG is the hearts and minds of humans… I would say the Center of gravity in that center is family men… what do you think? Maybe? Strip everything away and get down to the most basic elements… a group of folks desperate to experience God…. Just trying to teach and live the way of Jesus…It is all we should care about…as Christians we do see things differently…the RED PILL has allowed us to see God’s Wonderland for all it is…all the Blessings and at times we know we have to confront the evil in it as well. anyhow… ponder that for a second…. So what are the weapons? 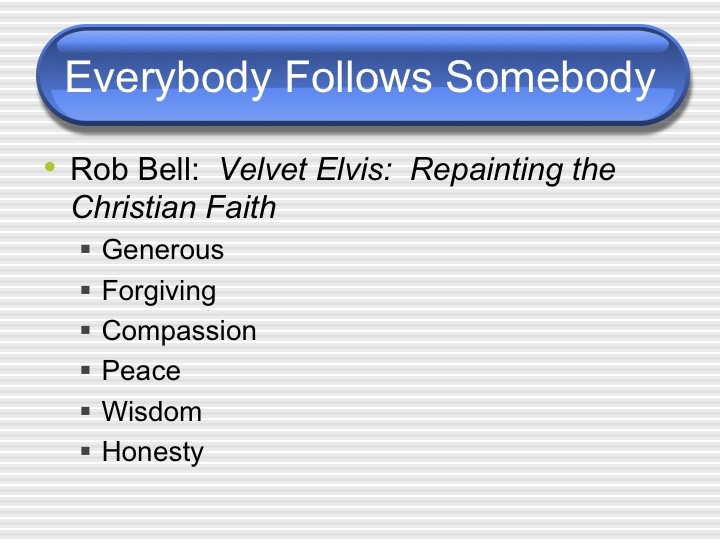 God chooses people to be used to bless OTHER people… look at the Chief! (I promise I will get back there)…. I would say many for good reason. We reclaim the church as a blessing machine not only because that is what Jesus intended from the beginning but also because serving people is the only way their perceptions of the church are ever going to change…. hearts and minds…right? 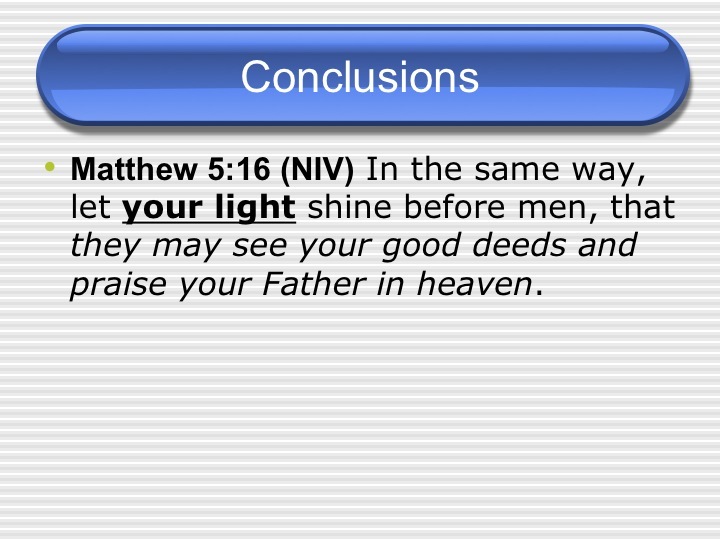 This is why it is so toxic for the gospel when Christians picket, boycott and complain about how bad the world is….Why blame the dark for being dark? Evil for being evil? 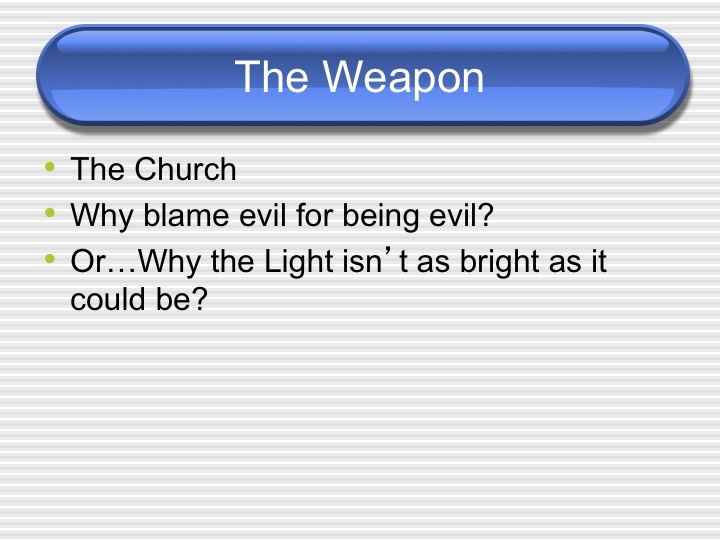 It is far more helpful to ask why the light isn’t as bright as it could be…. Rev. Sykes worked for Dr Martin Luther King Jr… he mentioned that the hate that killed Dr. King was just one example of the spiritual darkness that exists all around us. And that he had decided long ago to commit himself to punching holes in that darkness by letting God’s love shine through him. Sometimes the holes he punched were small, such as when he showed up with joy on his face instead of gloom. Other times the holes were bigger−like when he helped someone who was struggling. The holes that Dr. King had punched, on the other hand, were HUGE and were in fact still growing as more people read his words or honored his memory. So let’s go back to Rebecca…I don’t think I have shed so many tears as what I have just over this picture…What was the Chief…just a man, a man that comforted this baby to the point where she could rest… now I don’t know what ever happened to Rebecca, I like to think the Chief took her home and now she is safely living here in the States with a family…but I am not sure, but for this moment in time…this one man, on a tactial level struck a blow to the enemy, because Rebecca saw Jesus in Chief Gebhardt…(Matt 5:16) In the same way, let your light shine before men, that they may see your good deeds and praise your Father in heaven. Great play on the Matrix. Love the blue pill tie in too. We need more light to be sure, thanks for the inspiration. thanks for the note Andy….working on “One” (based on the U2 song) for the next go. Previous PostPrevious Sun Tzu or Bismarck: Who will Prevail in the 21st Century?